#SpeakForMe is a campaign to petition Indian MPs, Banks, Mobile operators and other service providers to speak for you against the Aadhaar linking coercion. You can go to #SpeakForMe to send your petition. As part of campaign I built a quick and dirty dashboard for the emails sent. This is a quick note on how I did that. 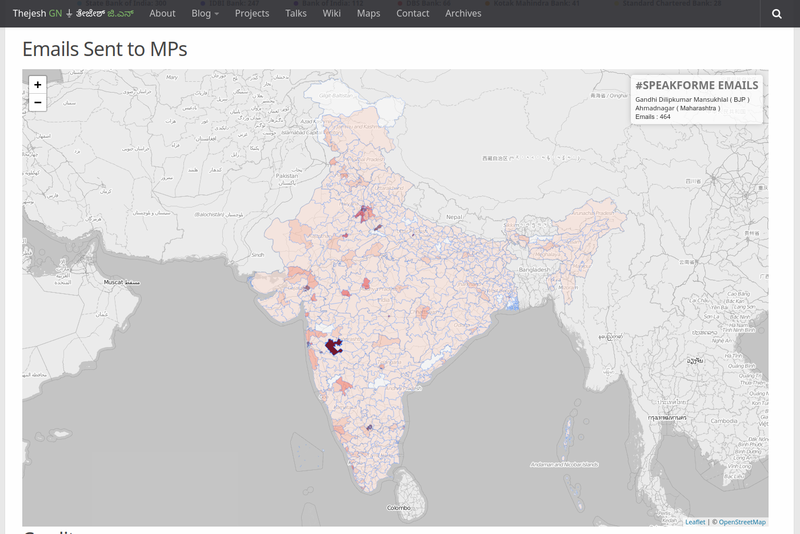 Part of #SpeakForMe dashboard showing emails sent to MPs on a PC map. First document is similar to what I used to scrape. Second one is a bigger document. It has number of emails at the level of service provider or MP. Attribute “stat” differentiates the two types of document. _id which is primary key is just a standard time-stamp. As you can see in the partial “mailbox_email_sent” document below. The key has two parts “type of provider” and “provider name”, separated by “/”. For airtel it is “mobile/airtel” etc. For mps it starts with mp and then has state code and parliamentary constituency number, Eg: “mp/mh-47”. Here is the copy of full document if you like to see. You can see the code that does everything here. I used Frappé Charts for charting. I love them. They are simple and look great. Basically analytics data gets stored in a CouchDB and served as standard restful that CouchDB provides to browser. Running couchdb to receive external authenticated webhook post and then serve the data as restful service worked like a charm. Of course I didn’t have much traffic to test under load. But since CouchDB is behind a CloudFront (Amazon CDN), I guess is it can take quite a bit of load. Usually the team pushes data every 5 minutes if there are updates. So it shows live status (see the last updated time stamp). At some point I will create graph of email traffic (daily emails sent etc). Any other graphs you would like to see? I will be happy to answer any questions if you have.